The slope shall be measured as shown in. Transitions from ramps to walks, gutters, or streets shall be flush and free of abrupt changes. Maximum slopes of adjoining gutters, road surface immediately adjacent to the curb ramp, or accessible route shall not exceed 1:20. The minimum width of a curb ramp shall be 36 in (915 mm), exclusive of flared sides. 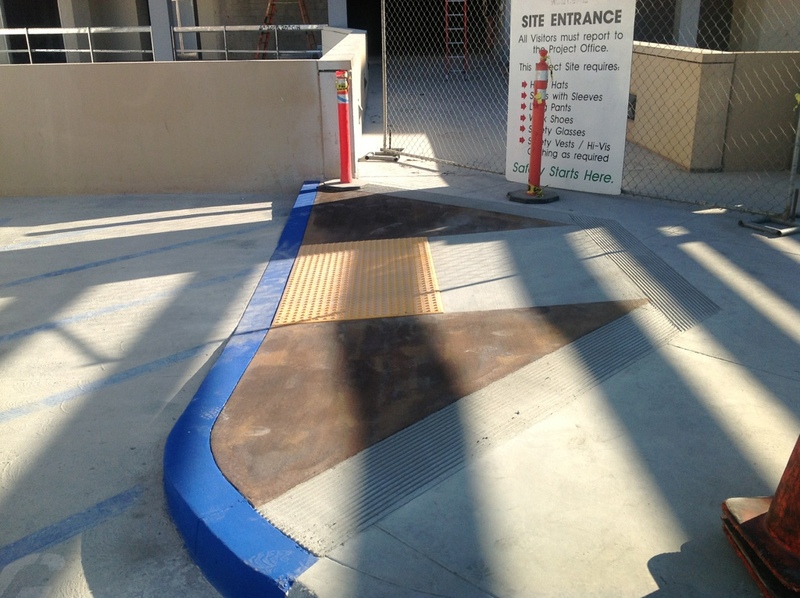 If a curb ramp is located where pedestrians must walk across the ramp, or where it is not protected by handrails or guardrails, it shall have flared sides; the maximum slope of the flare shall be 1:10. Curb ramps with returned curbs may be used where pedestrians would not normally walk across the ramp.